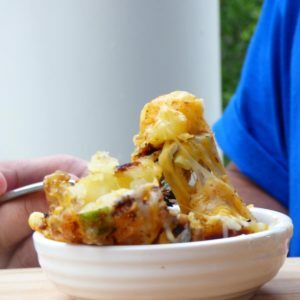 Evo Grill Recipe for Mexican Smashed Potatoes made right on the patio. 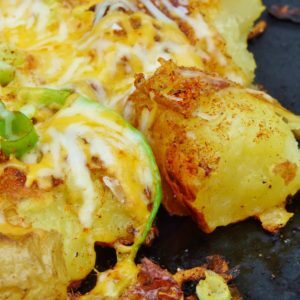 This recipe for Mexican Smashed Potatoes on the EVO grill just makes me happy. Sure, my EVO consistently performs on routine tasks for recipes like grilled chicken or seared fish and I can appreciate that. But other days, like today, it seems to just beat every other piece of equipment I own with its versatility and performance. And offers me the ability to prepare things both easily and better outdoors than in. And that makes me happy. Especially at clean up. 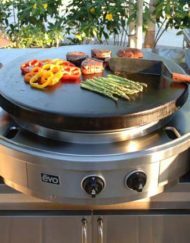 Cheese and seasonings can be placed directly onto the EVO grill to melt together. 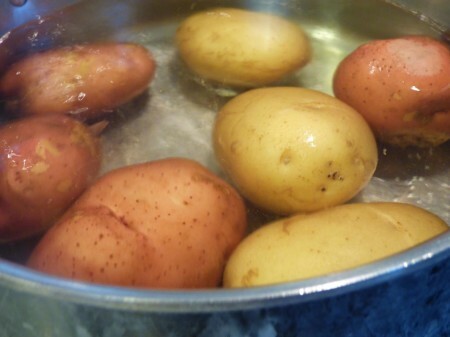 This is a simple recipe that I adapted from one that called for boiling potatoes on the stove top, then baking them off in the oven. But it’s summer and it’s hot. So I thought, “The EVO could do this job better AND without heating up the house!”. So I gathered my ingredients along with a cold glass of ice tea and headed to the patio. I pulled my Procart Evo over to the shade of my umbrella (because with wheels and no open flames I can do that) and started to cook. I figured as long as I was out there, I’d throw some fennel and zucchini on the grill for a cold antipasti salad as well. 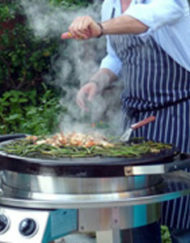 Both Indirect and Direct cooking can be done at the same time with the two separate zones of heat control on Evo grill. So into the center of the EVO grill set on high, I placed my large pan of salted water. While waiting for it to come to simmer to cook my red and Yukon potato mix, I went ahead with grilling the fennel medium in the outer ring. 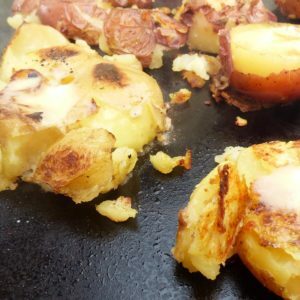 Once the potatoes were tender, about 20 minutes, I drained them off and placed them back into center of grill. 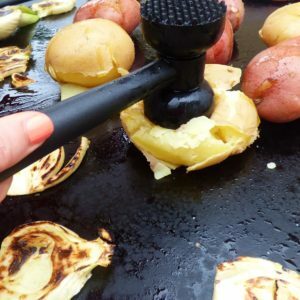 I drizzled the tender potatoes with Grapeseed oil and gave them a gentle “smash” with the hammer. 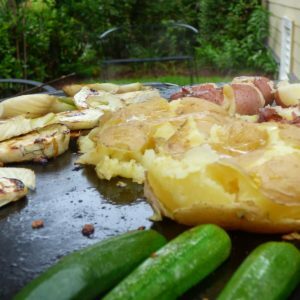 Smashing the potatoes directly on the EVO grill’s flattop surface. Potatoes begin to brown on the grill. I had decided to go Mexican with this EVO grill recipe. Scallions, grated Colby cheddar mix, and taco seasoning spiced up the spuds nicely. Seasoning for Evo Grill Mexican Smashed potatoes include scallions, shredded cheese, and taco seasoning. But I think you could adjust to what you like or are serving alongside. 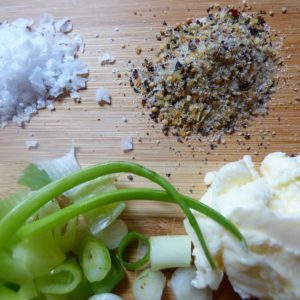 Perhaps steak seasoning , grated fresh horseradish, scallions and then finish with a dollop of cool sour cream. Or add crispy bacon, cheddar, and a drizzle of BBQ sauce at end? 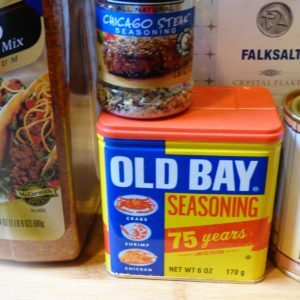 Maybe old bay seasoning, smoked paprika, and extra butter for seafood? I see many delicious possibilities with this recipe. Those are my favorite kinds of recipes to make. They allow for what your frig has in it or plate has on it. What’s in your spice cabinet? Seasoning possibilities limited only by your imagination. Once browned the potatoes are flipped. Once they were nicely browned and crunchy on one side I flipped them over (it’s fine if they crumble a bit, this just gives you more crunchy bits to enjoy!) Since my EVO center zone was set on this happened in under 5 minutes. 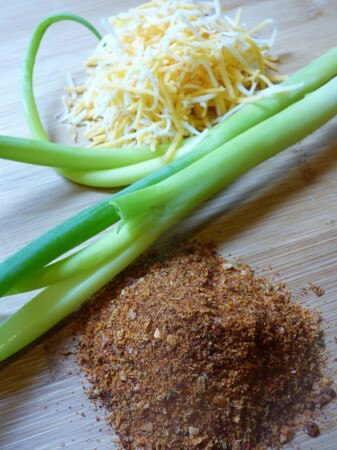 Then I turned down the heat to medium and added another drizzle of oil, cheese, seasoning, and chopped scallions. 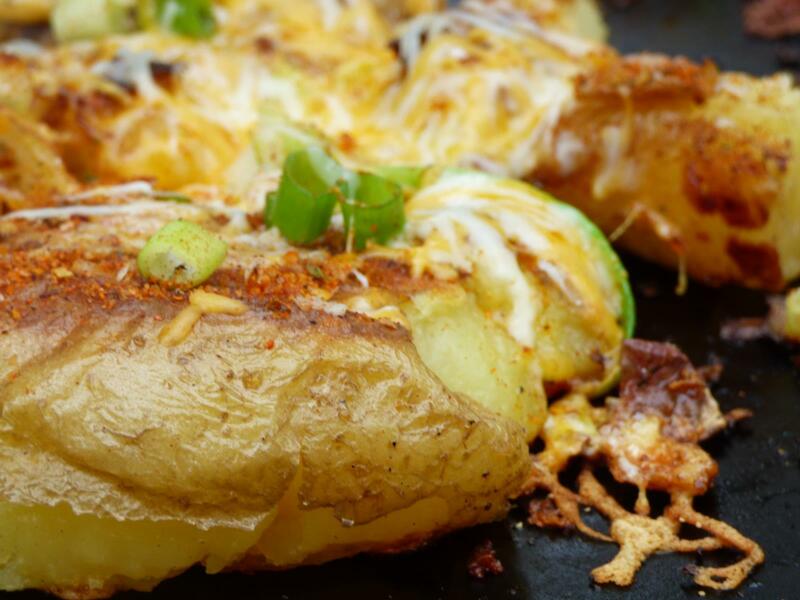 When the cheese had finished melting, I placed the finished potaotes into a cast iron skillet. 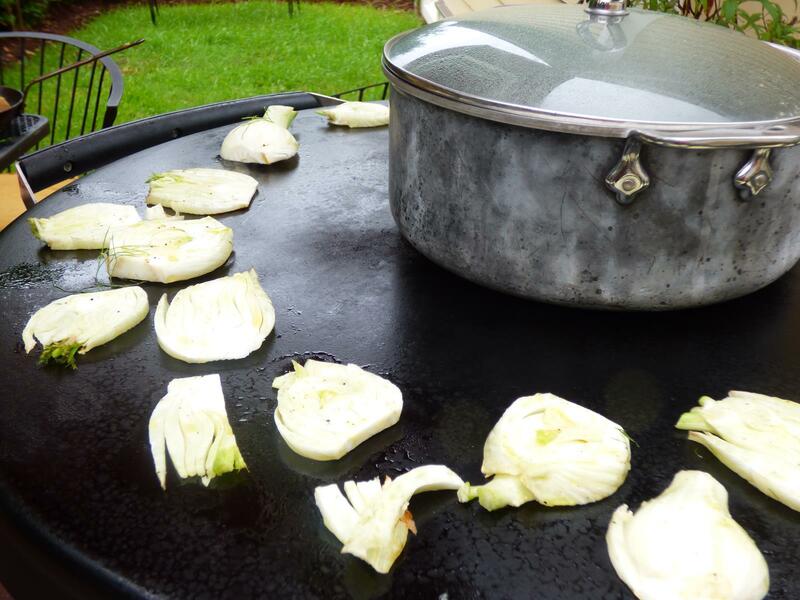 I had pre-warmed the pan atop my EVO in order to keep everything warm while serving. And here’s another reason I’m so happy. I went ahead and cleaned the grill before serving dinner. Because even with the sizzled on cheese, I just scraped the warm surface down and wiped it with a paper towel and a little oil. Done in 2 minutes. Everyone was happy. Kids, husband, and myself all had seconds. And I had been able to do it all on my EVO in the shade. 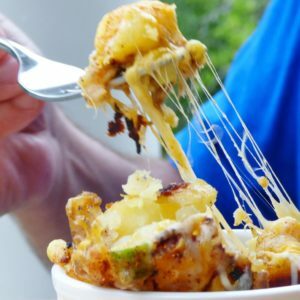 Love at first cheesy bite. 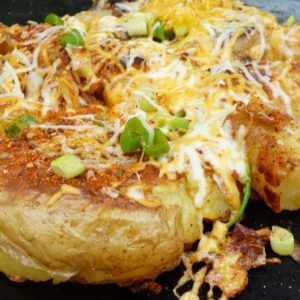 Anyone who is old enough to remember when potato skins had their place in the sun will appreciate this EVO grill recipe. That juxtaposition of creamy against crunchy, a little spicy and a lot of stringy cheese. 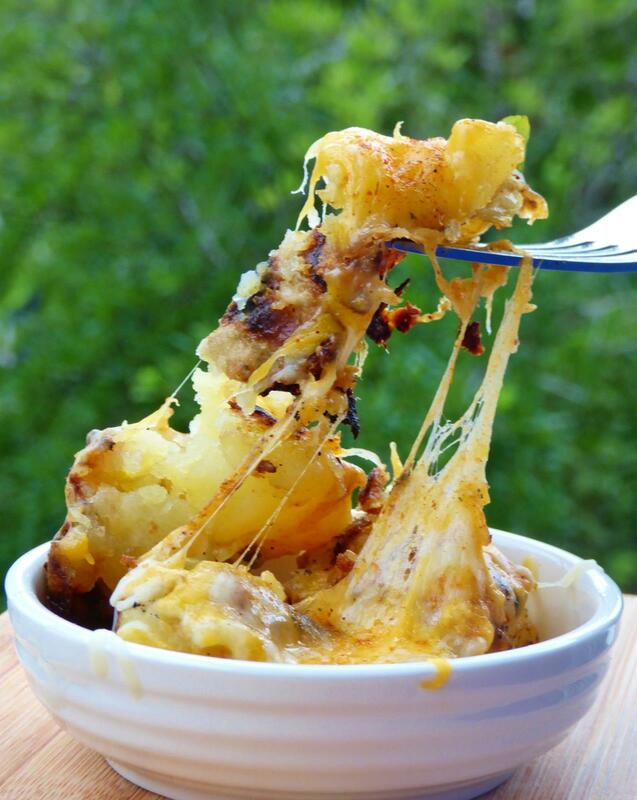 Comfort food from the grill. And almost no clean up for me. You can certainly make this Evo Grill Recipe without an EVO. I’m sure you will get good results, but definitely more dishes! However you decide to make it let us hear back from you. Tell us how it went and what combinations you used. I hope it makes you and your family as happily well fed as it did mine. Hey Teresa! So glad to have found your blog. This dish looks so tasty. 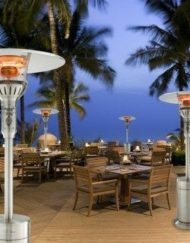 And I had never heard of the EVO Grill until today. I’ll have to read more of your blog posts. So glad I got to see you today! Thanks for the feedback Jessica! Let me know if you make any great variations on the smashed potatoes recipe. You can make them on stove/oven.